The Aqua Instant Vending Machine has been our most popular office coffee machine for the past 2 years. The Aqua Instant, as the name suggests, is a coffee vending machine which uses instant coffee and has three other canisters for the following: Tea, Hot Chocolate, Sugar or Milk. Want a one touch machine for customers without undergoing large expenses. Unfortunately no machine is perfect – we wish they were. Below we list the pros and cons of the Aqua Instant. Sometimes Saves Money – Because the Aqua Instant controls how much milk, coffee and sugar is dispensed per cup it enables companies to reduce their spend on these items. +-70% of companies land up saving money when using the Aqua Instant (when leaving out hot chocolate) however there are 30% of companies for whom the Aqua Instant doesn’t result in a cost save. Super Simple To Operate – Automatic coffee machines can be a little tricky for first time operators. Vending machines do not share this same problem. Everything is dispensed at the touch of a button. Large Capacity – The Aqua Instant is designed for large usage and has a storage capacity of 150 cups between fills. 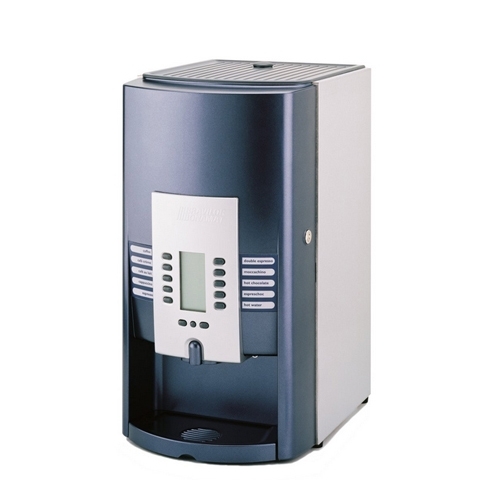 The Aqua Instant has a capacity for 240 cups per hour. Instant Coffee – Instant coffee has the benefit of being considerably cheaper than beans or capsules but it doesn’t taste as good. If you are looking for the best tasting coffee on the market this machine probably won’t give it to you. Not Fresh Milk and Not Full Cream Option – The Aqua Instant uses dehydrated milk which works out a lot cheaper than fresh milk but inherently has more lactose which makes it sweeter. The powder milk used is 100% fat free which makes it froth very well but might not meet the tastes of people used to only full cream milk.